Konami will unveil Dungeons & Dragons themed slot machines at this year's Southern Gaming Summit and National Indian Gaming Association Gaming Show. Dungeons & Dragons is an established name in the gaming industry, but now it's looking to establish itself in an entirely other gaming industry - the casino kind of game. 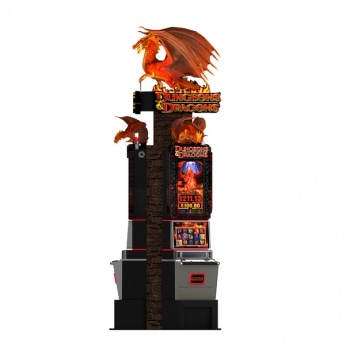 Working in close collaboration with Wizards of the Coast and Hasbro, Konami Gaming will be revealing its new Dungeons & Dragons themed slot machines at the 2014 Southern Gaming Summit and National Indian Gaming Association (NIGA) tradeshows. The slot machines will come in two flavors: Conquests and Treasures, and Enchanted Riches. They will be placed in pods of two, three, and four, and will feature glowing runes, faux stone design elements, hand painted 3D dragon toppers, and a variety of sign packages including one with a rotating red dragon. "Customers will experience new levels of fun and engagement on their gaming floors because Dungeons & Dragons combines the most successful fantasy-themed game franchise in history with Konami's industry-leading casino game design," said Matt Reback, Vice President of Marketing at Konami Gaming. Action RPGs like the Diablo series are basically loot slot machine games, but somehow, I don't see Dungeons & Dragons players flocking to these. Perhaps that isn't the target audience, but in that case, why try to cash in on brand appeal? Is this simply a play by Wizards to further spread name recognition and build hype for the release of 5th edition?